Separate dough into 8 rounds. Place 1 crescent round on an ungreased baking sheet for the bunny head. 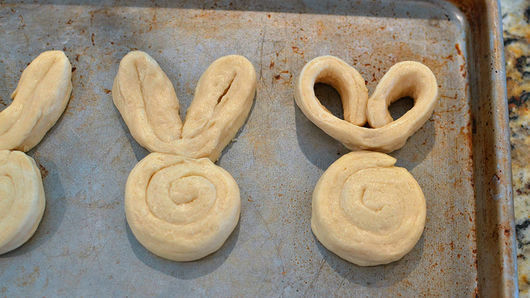 Unroll another round and shape into bunny ears by meeting the 2 ends in the middle and place at the top of the bunny head on the baking sheet. Gently pinch the 2 dough pieces together (the head and the ears). Repeat with the remaining dough to make a total of 4 bunnies. Use the palm of your hand to slightly flatten each bunny. Brush the surface with olive oil and sprinkle with garlic salt. 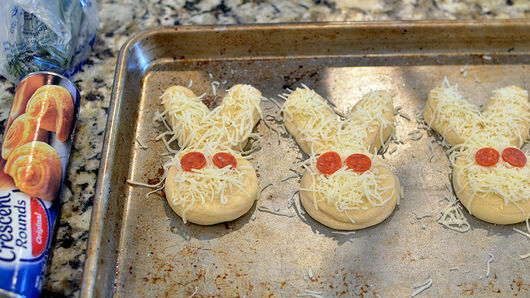 Evenly sprinkle 1/2 cup shredded Italian 4-cheese blend across all 4 bunnies and place 2 pepperoni slices on each one as eyes. Bake for 10-12 minutes. Remove from oven and let slightly cool. Decorate with pineapple slices as teeth and sliced green onions as whiskers. Serve with pizza sauce for dunking. 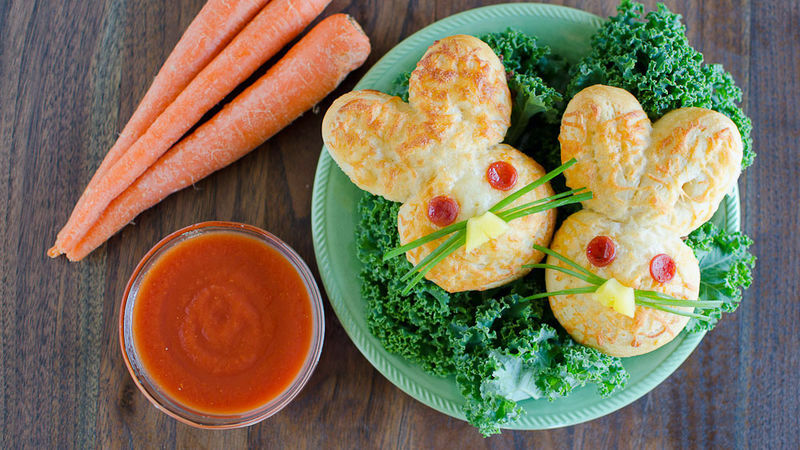 Use any of your favorite pizza toppings to decorate your bunnies. Sky’s the limit! Try an Alfredo sauce as a base before sprinkling on the cheese to add another layer of flavor.